From writer Ian Edginton (BATMAN) and artist Matthew Dow Smith (ADVENTURES OF SUPERMAN) it's the greatest intercontinental crossover of the '60s that never happened--until now: BATMAN '66 MEETS STEED AND MRS. PEEL! Batman and Robin, the Dynamic Duo of Gotham City, finally fight side by side with England's dashing spy partners, Jonathan Steed and Emma Peel from the world of the cult-classic British television show The Avengers. 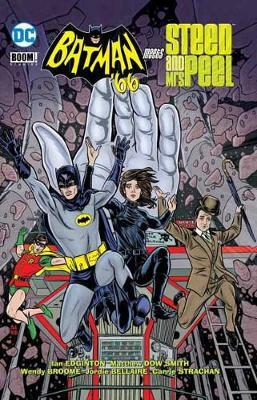 When Bruce Wayne and his fetching new British business associate find themselves caught up in Catwoman's caper to steal England's White Star diamond, Batman is nowhere to be found--but in the Caped Crusader's absence, gentleman spy Jonathan Steed and his intrepid partner Mrs. Peel are good enough to stop by and trap the thief! But it turns out that Catwoman wasn't working alone. Gotham City soon finds itself under attack by Steed and Mrs. Peel's mechanical enemies the Cybernauts--aided and abetted by Batman's aristocratic antagonist Lord Ffogg! With the White Star still in danger, the crime-fighting quartet has no choice but to rush across the pond and dive headlong into danger. But will the prowess of this transatlantic team-up be enough to save the world from an army of rampaging robots? Collects BATMAN '66 MEETS STEED AND MRS. PEEL #1-6.